An important step has been made in the rapid transit project that will link downtown Gresham and Portland, as local funding has been completely secured. 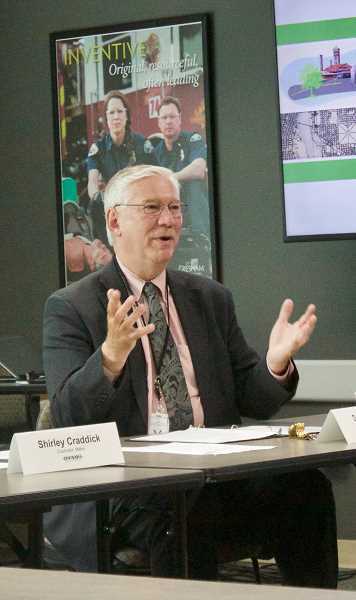 The update on the Division Transit Project was made during a policy and budget committee meeting Monday afternoon, Sept. 17, at Gresham City Hall. The gathering focused on the project budget, schedule, scope and design. Plans for the public transit system are about one third of the way complete. "Let's put the rapid in bus transit," said Doug Kelsey, TriMet general manager. "Right now it takes too long to get this region where it needs to go." The Division Transit Project will utilize longer, articulated buses, allowing room for 60 percent more riders. It will include multiple-door boarding, expanding bus stations with better amenities, and traffic signal priority. "That is the backbone of this project," said Steve Witter, capital projects and construction executive director. "We need to get the buses through traffic faster." The local funding component of the project has been closed, with a total of $174,703,335 raised. The city of Gresham brought half a million to the table through funds and in-kind contributions. Now the money focus will shift toward the Federal level, with a delegation of representatives heading to Washington, D.C., to try and secure the necessary support. "This puts us in a really great position to seek assistance from congressional avenues," Witter said. "Completing the local funding is a phenomenal achievement." The 15 mile-long rapid bus route will service the Division Street corridor between the two cities with a series of up to 40 enhanced stations spaced about a third of a mile, between Union Station and the Gresham Central Transit Center. It will span the Willamette River at the Tilikum Crossing between Southwest and Southeast Portland. "Division is one of our busiest lines, and it has our most pass-ups — when a full vehicle has to ignore waiting riders," Witter said. The stations will have weather protection, lighting, real-time info, seating, leaning rails, trash receptacles and bike racks. Some of the layouts of the stations will vary based on the space available, as the project designers don't want to negatively impact the neighborhoods. "The one-size approach won't work," said Sarah Espinosa, division transit construction project manager. "We are creating a continuity of stations while remaining flexible." One idea to avoid conflicts with bike lanes is to have them run between where the buses pull up and the stations. Flashing lights or a signal will warn bikers to slow down and stop when the buses unload passengers, allowing pedestrians to safely cross the bike lane. A full-scale mock-up is planned to test out the system. Planning for the project began in 2014, with a locally-preferred design being unanimously approved by the cities of Gresham and Portland, the Multnomah County Commission and the TriMet Board of Directors two years later. TriMet is currently in the design and construction phase, which will run through 2020. It will encompass the stations, adjacent crossings and modifications at major intersections along the route. Construction should begin in late 2019, with service beginning in 2022.